My name is Gordon Gillis, CEO of Safety Services Hawai’i. Giving you access to all the best tools, teachers, and trainings you might possibly need to save your business money and keep your workers’ safe, happy, and productive. On this page I’m going to talk to you about our Scaffold User Training Programs. Scaffolding accidents typically involve workers who slip and fall, but accidents can also occur due to poorly constructed scaffolding, falling objects, planks giving way or lack of supervision. In 2009, the most recent year for which OSHA has compiled data about scaffold accidents, 54 fatalities occurred due to scaffolding-related accidents. A staggering 72 percent of scaffolding accidents occur when a support plank gives way or an employee slips. 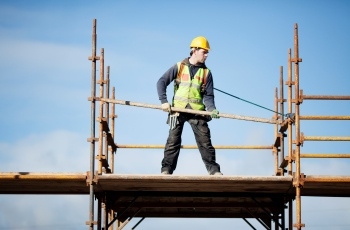 There are approximately 10,000 construction worker injuries every year that involve scaffold accidents. The majority of these scaffold accidents involved a failure to comply with OSHA safety standards. Almost 25 percent of the people injured in these accidents receive no scaffold training and were not aware how to safely work on a scaffold. As crazy as it may seem, 77 percent of scaffolds are not equipped with guardrails, which is a leading cause for falls in scaffold accident cases. All of these scenarios are preventable, and could save roughly 50 lives and prevent nearly 4,500 scaffold accidents every year – almost half of all scaffold accidents. The Supported Scaffold User Training course is designed to help the scaffold user recognize the hazards on various types of scaffold. The course covers the safety aspects regarding scaffold foundations, scaffold components, regulations, guardrail requirements, and fall protection. This course has a three-year certification. The course incorporates a PowerPoint presentation and student interaction that encourages participation.